The cheongsam (qí páo 旗袍), or Qipao in Chinese, is evolved from a kind of ancient clothing of Manchu (mǎn zú 满族) ethnic minority. In ancient times, it generally referred to long gowns worn by the people of Manchuria, Mongolia and the Eight-Banner. In the early years of the Qing Dynasty (1644-1911), long gowns featured collarless, narrow cuff in the shape of a horse's hoof, buttons down the left front, four slits and a fitting waist. Wearers usually coiled up their cuff, and put it down when hunting or battling to cover the back of hand. In winter, the cuff could serve to prevent cold. The gown had four slits, with one on the left, right, front and back, which reached the knees. It was fitted to the body and rather warm. Fastened with a waistband, the long gown could hold solid food and utensils when people went out hunting. Men's long gowns were mostly blue, gray or green; and women's, white. When the early Manchu rulers came to China proper, they moved their capital to Beijingand cheongsam began to spread in the Central Plains. The Qing Dynasty unified China, and unified the nationwide costume as well. At that time, men wore a long gown and a Mandarin jacket over the gown, while women wore cheongsam. Although the 1911 Revolution toppled the rule of the Qing (Manchu) Dynasty, the female dress survived the political change and, with succeeding improvements, has become the traditional dress for Chinese women. Till the 1930s, Manchu people, no matter male or female, all wore loose-fitting and straight-bottomed broad-sleeved long gowns with a wide front. The lower hem of women's cheongsam reached the calves with embroidered flower patterns on it, while that of men's cheongsam reached the ankles and had no decorative patterns. 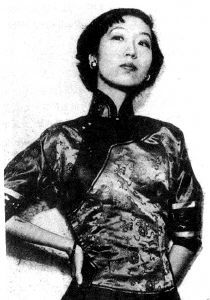 After the 1940s, influenced by new fashion home and abroad, Manchu men's cheongsam was phased out, while women's cheongsam became narrow-sleeved and fitted to the waist and had a relatively loose hip part, and its lower hem reached the ankles. Then there emerge various forms of cheongsams we see today that emphasize color decoration and set off the beauty of the female shape. Why do Han (hàn zú 汉族) people like to wear the cheongsam? The main reason is that it fits well the female Chinese figure, has simple lines and looks elegant. What's more, it is suitable for wearing in all seasons by old and young. The cheongsam can either be long or short, unlined or interlined, woolen or made of silk floss. Besides, with different materials, the cheongsam presents different styles. Cheongsams made of silk with patterns of flowerlet, plain lattices or thin lines demonstrate charm of femininity and staidness; those made of brocade are eye-catching and magnificent and suitable for occasions of greeting guests and attending banquets. When Chinese cheongsams were exhibited for sales in countries like Japan and France, they received warm welcome from local women, who did not hesitate to buy Chinese cheongsams especially those top-notch ones made of black velour interlined with or carved with golden flowers. Cheongsam features strong national flavor and embodies beauty of Chinese traditional costume. It not only represents Chinese female costume but also becomes a symbol of the oriental traditional costume.